WESTPORT, CT (Oct. 5, 2017) — Outside TV is thrilled to introduce another exclusive series, “A Life in Proximity,” to their streaming platform Outside TV Features. The original series, produced by Teton Gravity Research (TGR) in association with Taylor Steele and commissioned by Outside TV, follows eight of the world’s best surfers around the globe in search of the ideal wave. “A Life in Proximity”premieres Oct. 19, 2017, exclusively on Outside TV Features. In May 2017, Teton Gravity Research and award-winning director Taylor Steele debuted “Proximity,”the movie, to widespread industry acclaim. Outside TV’s “A Life in Proximity” series builds upon the film and takes a deeper dive into the stories that Steele’s project tells. The new show features the same athletes who starred in the series’ namesake, following them as they surf and explore some of the most exotic destinations in the world. 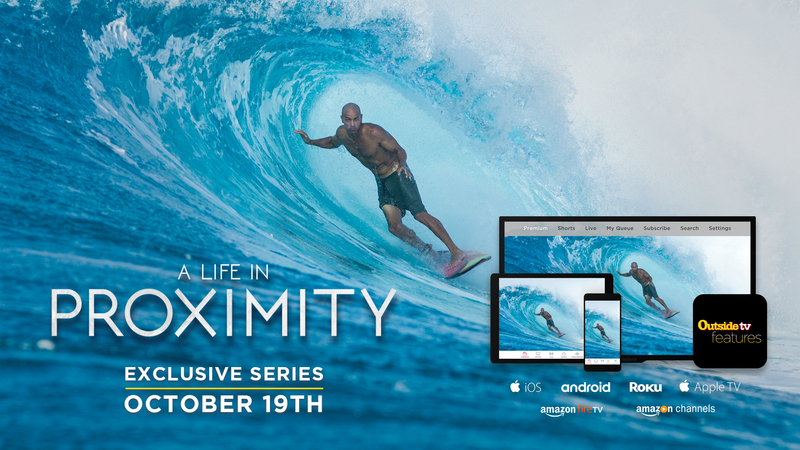 Similar to the film, but now with greater detail, the “A Life in Proximity” series’ featured athletes are uniquely paired up, one legendary surfer and their counterpart from the new generation, to travel together in search of pinnacle surfing experiences. In episodes one and two, follow Hawaii natives Albee Layer and Shane Dorian as they explore the rugged coast of Scotland to find the heaviest waves possible. In episodes three and four, six-time world champion Stephanie Gilmore and freesurfer Dave Rastovich take the viewer to the unmarked coastline of Baja, Mexico, looking for pointbreaks. Craig Anderson and Rob Machado battle the freezing, violent ocean of Chile’s southernmost coast in episodes five and six, followed by snow- and ice-filled Japanese waters in episode seven. To wrap up the series, in episode eight, Kelly Slater and John Florence journey to the remote Islands of the Pacific to surf perfect waves in warm, crystal-clear waters. “With talent so stacked on a project like Proximity, and so many intense locations explored, it’s almost impossible to showcase every highlight in the confines of one film. With the ‘A Life in Proximity’ series, we can take viewers further into these incredible trips and show meaningful moments that we just didn’t have room for with the original release,” says producer Taylor Steele. “A Life in Proximity”will premiere on Oct. 19 and new episodes will be added on a weekly basis, every Thursday, over the course of the following seven weeks. “A Life in Proximity”will stream exclusively via Outside TV Features. Outside TV Features is a free app from Outside TV, streaming thousands of short-form videos (for FREE) and full-length feature films and series (for $4.99/month). Outside TV Features is available via iOS, Apple TV, Android, ROKU, Amazon Fire TV and Amazon Channels. ← POLL: Which is your favorite photo of fall foliage in the Mt Washington Valley.